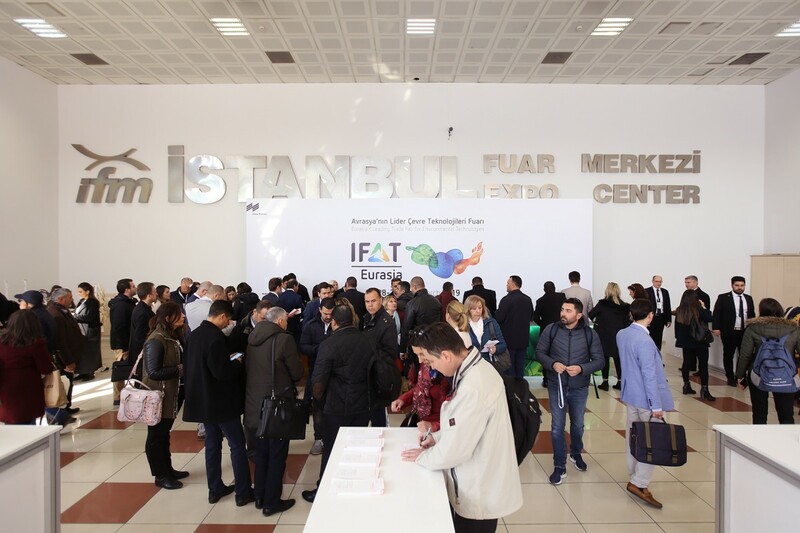 April 11, 2019 On March 30, 2019, the third edition of IFAT Eurasia held at the Istanbul Expo Centre (IFM) in Turkey ended. The environmental technology fair convinced with its strong internationality: the 10,467 trade visitors came from 84 countries (2017: 68 countries) to find out about trends in the water, sewage, waste and recycling sectors. Compared to the previous edition, the international participation has increased by 60 percent when compared with the last edition and reached to 16 percent in the total visitors. Besides Turkey, the countries with the most exhibitors were (in that order): Germany, China, Switzerland, Austria and Italy. For the first time, the Turkish edition of the world's leading trade fair IFAT in Munich also attracted companies from Canada, Brazil, Ukraine and Ghana. New international partners included the Federal Association of the German Waste, Water and Raw Materials Management Industry (BDE), the Bureau of International Recycling (BIR) and the German RETech Partnership. And also visitor-wise there was massive international interest, as exhibitor Berkay Koç, Environmental Engineer at Emi Çevre confirmed: “We were very satisfied with our trade fair presence. We encountered many foreign visitors, especially from Romania, Finland, Poland, Greece, Morocco and many other countries. We will participate in 2021 again.” A separate presentation and networking area was set up in the three exhibition halls for the numerous business delegations from Iran, Iraq, Jordan, Lebanon, Kazakhstan, Morocco, the Maldives, Cyprus, Russia, Tunisia and the United Arab Emirates. Another highlight of the supporting program was the International Environmental Conference, in short: IREMCON. Under the banner of “Combating Global Climate Change and Strengthening International Cooperation in Waste Management”, the leading environmental conference of Turkey and the entire Balkan region took place for the first time as part of IFAT Eurasia. Another novelty was the Buyers Mission program. The initiative of the Turkish Ministry of Economy brought together solution providers and solution seekers in a targeted manner. IFAT Eurasia was the first of a total of six international IFAT fairs to be held in 2019: IE expo China in Shanghai (April 15 to 17), the premiere edition of IE expo Chengdu in Chengdu (June 27 to 29), IFAT Africa in Johannesburg (July 9 to 11), IE expo Guangzhou in Guangzhou (September 18 to 20) and IFAT India in Mumbai (October 16 to 18). Together with the world's leading trade fair for the sector IFAT in Munich—the parent fair—they form the world's largest and leading network for environmental technologies. The next edition of IFAT Eurasia will take place in Istanbul in spring 2021. More information on the event can be found at www.ifat-eurasia.com.